The 1990s became a decade jam-packed with crossovers (the most notorious was surely the Punisher/ Archie combo which must have been concocted during a particularly heavy Crack Den sesh) as publishers looked for more and more outrageous ways of shifting mass quantities of copies. 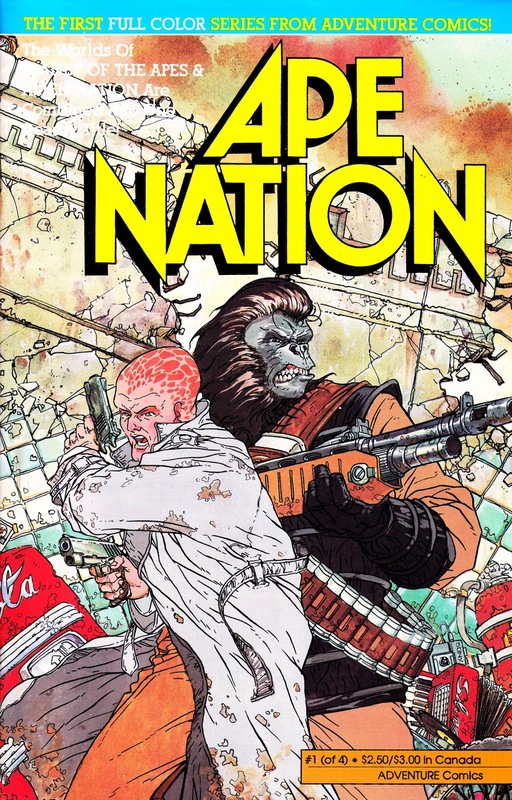 This February 1991 effort from Adventure Comics was one of the first… but no less bonkers: The publisher already had a bunch of reasonably successful ALIEN NATION and PLANET OF THE APES mini-series so, as both screen properties were owned by the same studio, a crossover was relatively easy and too tempting to resist. Voila: APE NATION. Of course, the fact that the two franchises exist is two obviously entirely different continuities was no hindrance to a "good" idea so in this four-parter, Adventure's first colour series, a Newcomer vessel arrives on the Ape-Earth of the distant future. I believe this was slated for a trade paperback collection at the time but I'm not sure whether it ever happened. It's certainly not been reprinted since (something it has in common with all the other Adventure books from both franchises) which, despite its wonky premise, is a shame.